Since we are moving, one of my many (many!) pre-moving goals is to use up as much of our pantry as possible. After all, all those tins of grains and jars of condiments (freekiah from Jordan, Turkish aci biber, honey from Senanque Abbey in Provence) cannot come with us. And while using up that whole bottle of sriracha before we leave is a bit too ambitious, I can easily tackle some of our other pantry staples, even though it might mean we eat a lot of bulgur pilafs in the coming months. One of the things in the pantry is amaranth flour. I always like to have one or two unusual flours around to play with, things like sorghum, graham, teff or dark rye. Amaranth is a gluten free flour that has a slight sweetness to it (it is a grain, but its leaves can also be cooked and eaten). Amaranth is often used in cookies and cakes, though it is usually mixed with other flours since amaranth alone can have a slightly over powering taste. One of the really nice things about baking with amaranth is that it seems to absorb and hold a lot of moisture, which means that cookies don't spread too much in baking and that flavors like vanilla extract, coconut extract, or liqueurs shine through really brightly. This particularly recipe incorporates almond flour and amaretto, and the liqueur taste really adds a depth of flavor. This is the perfect snack cookie or lunch box addition, and they keep particularly well. This recipe is a great chance to break out your scale if you have one. 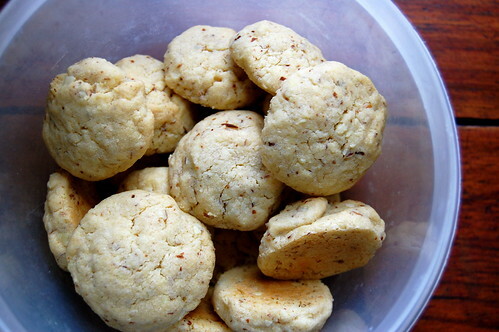 You can substitute a gluten-free flour mixture for the pastry flour to make these gluten free. 1 Place the almonds and 2 tablespoons of the sugar in the bowl of a food processor. Process until the mixture looks sandy and the nuts are roughly ground, about 15 seconds. 2 Whisk together the two flours and salt in a medium bowl. In a large bowl, cream the butter using either a fork or an electric mixer, until smooth. Gradually add the remaining sugar and beat until fluffy and smooth. Add the egg yolk, liquor, and vanilla and beat until well blended, about 30 seconds. Reduce the speed to low and beat in the nut mixture, then gradually add the flour mixture until it is just incorporated. Cover the bowl with plastic wrap and chill until the dough is firm, at least 90 minutes or overnight. 3 Preheat to 350°F. Line 2 large baking sheets with parchment paper. Pinch off walnut-size pieces of the firm dough and roll them between your palms into smooth 1-inch balls. 5 Bake, 1 sheet at a time, until the cookies just turn golden brown around the edges and firm up but still yield to gentle pressure, 17 to 18 minutes. 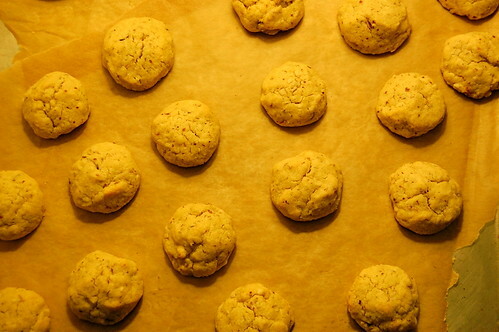 Remove from the oven and carefully slide the parchment paper with the cookies onto a wire rack to cool. The cookies will crisp as they cool.